I have been involved in building and maintaining a G-Scale train layout at Pittsburgh's Children's Hospital for many years. It has two trains, one on the lower level of the layout and a trolley that runs on a point-to-point that is raised above the rest. Each train and a number of animations and sounds are triggered with buttons that are placed on the skirt of the layout. Pressing a button starts a train or other item for a set time. This arrangement is ideal for the hospital environment with the train buttons being pressed hundreds and hundreds of times each week. The hospital was recently given a beautiful O-Scale (Lionel) layout that will be installed at the hospital for the children to enjoy. It has four trains that run on several different levels. This layout operates using Lionel's LionChief radio control. This is a radio control system with a separate transmitter for each engine. The engines pick up power from the track and operate when a radio command is received from its unique transmitter. What follows is a description of how I modified the trains to operate from pushbuttons like those on the G-Scale layout. There are two versions of LionChief, the standard variety (simply called LionChief) and a newer version called LionChief Plus. Both have hand-held radio control units that operate from 3 AAA cells. The controller has a knob that adjusts the speed and direction. When in the center position the train stops. Turning it right speeds the train up in a forward direction while turning it to the left increases speed in a backward direction. The standard LionChief is on the left and the Plus is on the right. Both versions run from DC or AC track power set to about 18 volts. The Plus will also operate from an AC transformer in a manner similar to older Lionel engines. When the train is set to transformer operation, with a small switch on the loco, and AC power is applied the locomotive starts in neutral. When the AC is briefly interrupted and restored the engine goes forward. Another interruption puts the engine back in neutral and another has it going backwards. To operate trains that are normally run with a remote control a few things need to be done. First the hand-held transmitter needs to be modified to operate from a plug-in power supply rather than 3 AAA cells. Three AAA cells provide 4.5 volts DC to the transmitter. The same voltage can be supplied by a common cell phone charger that provides 5 volts DC. Adding a single silicon diode in series with the positive lead drops the voltage from 5 volts to about the same 4.5 volts that is supplied by the batteries. This photo shows the transmitter for a LionChief loco. A black wire has been soldered to the negative battery terminal. Note that this is one of two terminals that are NOT joined to the adjoining battery by a piece of metal. This connection can be clearly seen in the top right area of the battery box and again in the bottom left. The positive red wire is soldered to the positive terminal through a 1N4001 diode. Note the orientation of the band on the diode. This photo is of a LionChief Plus transmitter's battery box. Note that the positive terminal is at the top in this unit. The red wire is connected to the positive terminal of a cell phone charger and the black wire goes to the negative. If these are accidentally reversed the diode will not conduct, protecting the transmitter from damage. Once the modification is made all transmitters are set to an appropriate speed and left powered on. To start a train power is supplied to the track. To stop it track power is removed. 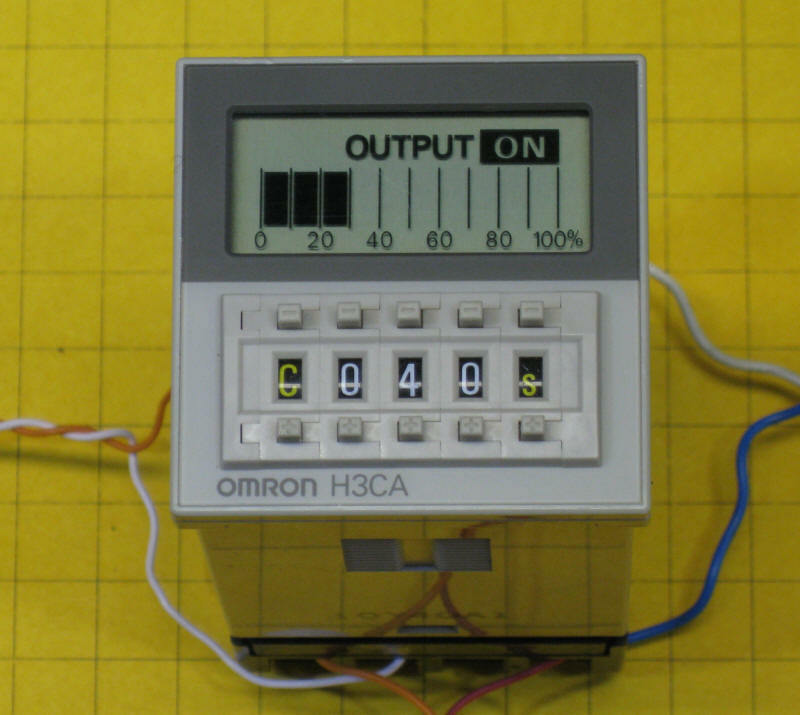 This is done by wireing a simple circuit using an Omron H3CA timer. This device is a digital timer that can be configured to activate a relay for a set time (40 seconds in the photo here) when a button is pressed. When the time expires the relay opens. Here is the circuit board that is inside of the Thomas controller. The ratio module is in the upper right (labeled U2). The processor is in the center, U1. This is a transmitter for LionChief Plus. The same radio is in the upper right (U2) and the processor is U1.